Chances are if you have gone to a trade show, then you have likely seen or even used at least one of these types of displays in the past. You might just not have known the exhibit name. This article will give you the basic understanding of what different types of displays are out there and what they are called. There are three general types of portable solutions out there that you may want to use to professionally represent your company or organization. 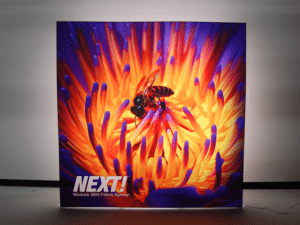 Banner stand, pop-up and table top displays are typically quick to set up, can be done by one individual and generally do not require tools to set up. These can give you a lot of bang for your buck. 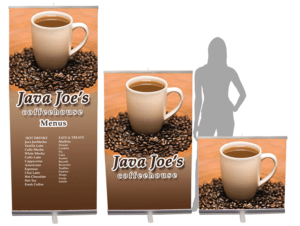 Banner stands are extremely lightweight, easy to set up and quite cost effective overall. They are perfect to grab attention and can provide versatility between events. Put 3 together and create an attractive backwall solution. When you aren’t using your banner stands at a show why not pop one up in your office entry! 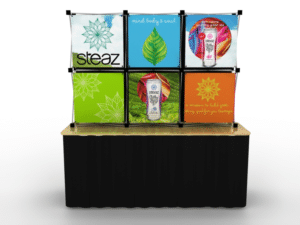 Pop-up trade show displays come in several shapes and sizes. They are eye-catching, economical, easy to assemble and are very durable. These simple set ups make shipping pop-ups to the show a breeze. 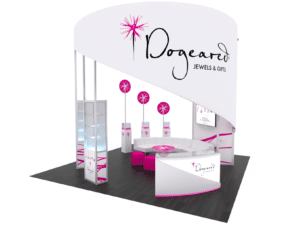 For those smaller shows where there isn’t much room available for every exhibitor, a tabletop display can be an effective and striking way to represent your organization or company. From briefcase style tabletops to custom exhibits, table tops are available in countless forms, shapes, sizes and cost ranges. 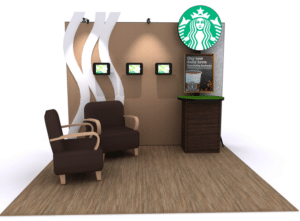 These are perfect for exhibitors who desire more structure in their trade show booth. We offer a wide range of inline exhibits, with varying degrees of difficulty, when it comes to assembly. Each display can be customized to meet a customer’s individual needs. 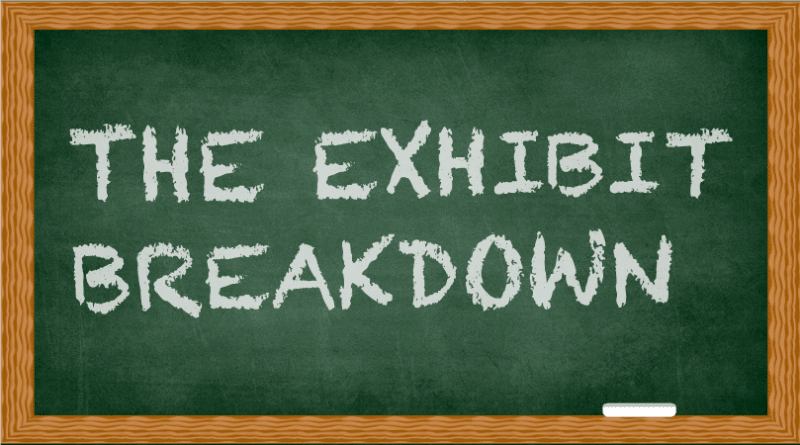 Overall, these exhibits aren’t usually extremely difficult to set up, but there may be some tools required and more time needed, compared to the pop up displays. If you’re intimidated by the use of tools for the set up, you may want to consider contracting an I&D company to complete the installation for you. We do, however, offer some inline exhibits with a more portable like set up, using turn knob assembly. There is nothing subtle about an Island Exhibit. These exhibits offer the most versatility and customization in design and tend to be for customers with more dollars in their budget. 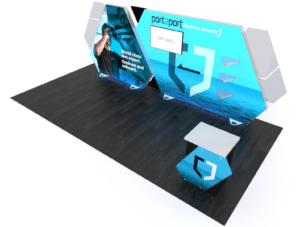 Island Exhibits are the types of trade show booths that have no limit to their creativity, allowing for presentation areas, meeting rooms, casual lounges, multiple demo areas, etc. Best part, a lot of islands have the ability to reconfigure to 10×10 and 10×20 displays, letting you get the most out of your build. 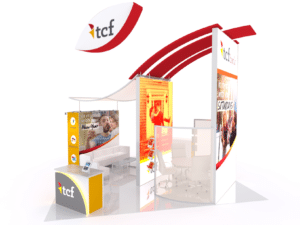 Hiring an experience I&D team to handle the set up of your exhibit is usually recommended. 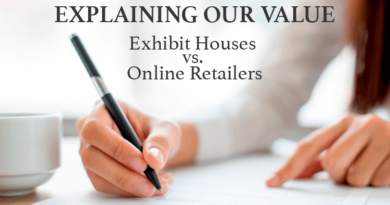 Remember, no matter what size exhibit you have it can always be successful if approached correctly. Have a plan, focus on the details and create a positive lasting impression! It’s actually a great and useful piece of information. I’m happy that you simply shared this useful info with us. Please stay us up to date like this. Thanks for sharing.